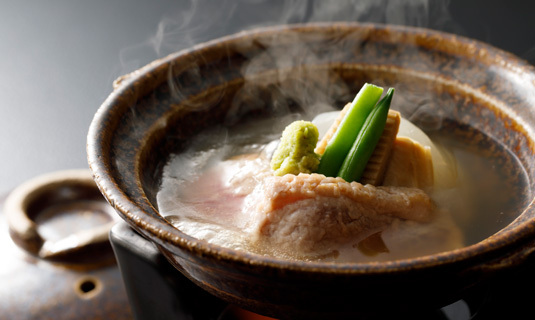 a hot pot dish is so tasteful that you will be charmed by its boiling sound,jibu-jibu. 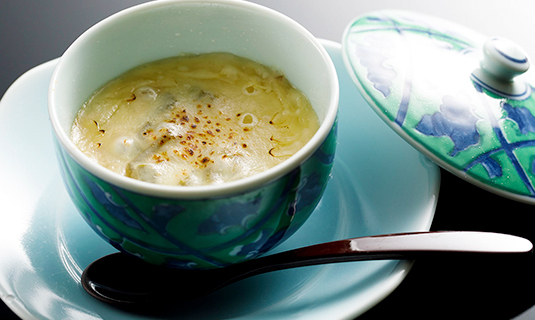 Jibuni is one of well-known Kanazawa delicacies. It is served on a small earthen pot heating at the table for you to enjoy piping hot jibuni. Colorful and traditional Kaga vegetables and fresh fish from tossed wave of Japan sea. Nutritious Kaga-renkon, lotus roots and ancient rice produced by Fukatani people and nature. Enjoy a seasonal taste. Enjoy a piece of seasonal delicacy and a toast. 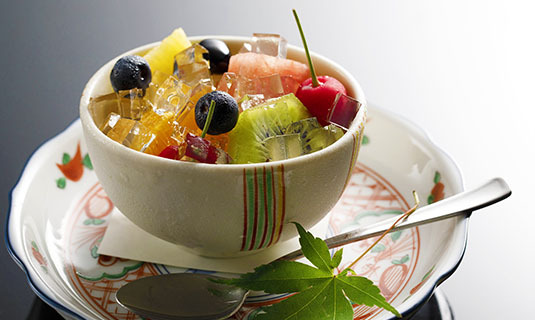 Seasonal ingredients are lovely arranged in small bowls one by one. Appreciate a small seasonal beauty in the bowl and enjoy nice sake drink. Sashimi of fresh seafood directly delivered from Nanao harbor in the morning. All seafood is gathered in the morning and directly delivered here. Enjoy a firm-textured fresh seafood only allowed to the local food. Located in the center of Noto peninsular, Nanao harbor has prospered as the biggest harbor in Noto. 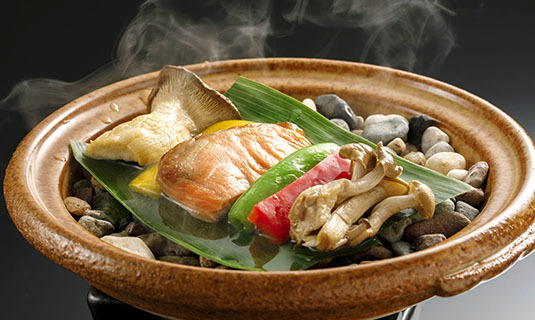 As it is at a good location where warm and cold currents meet, many kinds of seafood is landed throughout a year, such as fresh fish caught off the coast near Noto or fish with plenty of fat on them grown by rich snowmelt from Tateyama mountains. We serve only the natural local seafood landed at Nanao harbor. Hand-stretching noodles kneaded kinjiso, one of Kaga vegetables.Enjoy firm but smooth texture due to stickiness of kinjiso. Eating with wild vegetables, you will taste both firmness and crispiness. Jibuni, you will be charmed by its boiling sound, jibu-jibu. Jibuni is an authentic Kanazawa cuisine of duck meat, sudarefu, and seasonal vegetables simmered with slightly thick soup.We serve ingredients on a small earthen pot heating at the table for you to enjoy piping hot jibuni.The earthen pot starts to steam and duck meat changes its color into pink, it is when you taste the dish. Please have it adding some horseradish. Crunchy Tempra of seasonal Kaga vegetables. Enjoy original texture of ingredients. 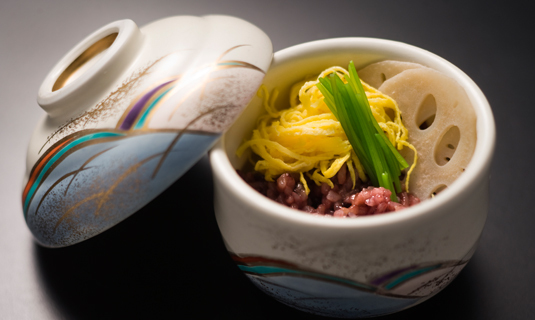 It is served with Ishiya’s special salt mixed with dried shiso leaves. Fresh local fish from Nanao harbor and local vegetables marinated in shiokoji or salted rice malt and grilled. Mild salty flavor of shiokoji extracts the original taste of ingredients. 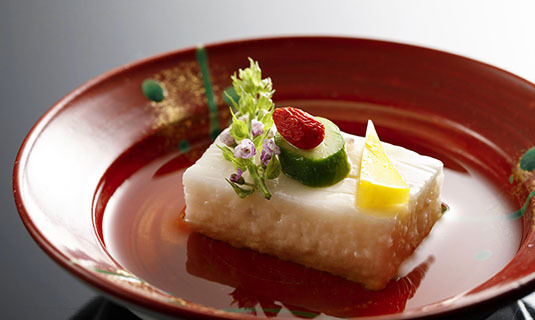 Ancient rice produced by clean water and fresh air in Fukatani is served as steamed sushi with mild vinegar flavor. Ancient rice is tasteful and nourishing. Each bite will fill your stomach and also your mind. Grated Kaga-maruimo is flavored by vinegar. Kaga-maruimo is so sticky that you can taste both the texture and the ease with which it goes down. It is served with some cucumbers and shrimps. Fresh acidity of seasonal fruits and sweetness of wine sauce flavored with almond essence make you happy after dinner. We use sweet wine, rice malt and soybean paste made by Takagi-kojiten, which is one of traditional Kanazawa manufacturers founded in Tempo period. Rice malt and soybean paste are produced courteously by the traditional methods and matured in cedar barrels. So they extract natural flavor of ingredients. You can buy them at a shop here. Why not buy one as a souvenir? For food materials freshness is most valuable. Yumoto Ishiya uses fresh local vegetables, fish and meat for guests to enjoy their authentic tastes.Enjoy the genuine Kanazawa taste. When it is cooked, ancient rice appears bright red like rice with red beans. It contains more nutrients of anthocyanin, a kind of polyphenol or minerals than white rice. So it is used for Chinese herbal medicine dishes. But it is hard to cultivate ancient rice and difficult to get them. That’s why it is sometimes called illusory rice. We use ancient rice cultivated by devoted farmers in Fukatani. Using eggs and rice sticking with the producing district or healthy seasonal vegetables of Kaga, we serve a delicious breakfast and wish you healthy in the morning. Tofu, soybean curd is the one we proudly recommend and has a good reputation. The chef makes them with special attention to the materials and texture. Paying special attention to the amount of natural nigari it is made to be as smooth as possible. Eat it with natural sault or soy sauce, and you can enjoy simple but flavorful taste. It is Motoyu Ishiya’s home-product made of Japanese apricots gathered at the mountain in Fukatani. Ume fruits are dried and processed with sault by traditional methods containing no artificial ingredients. Soft textured acid umeboshi matches cooked rice well. Sakura eggs gathered in the depths of Fukatani mountains. Eggs for Dashimaki egg dish is gathered in the depths of Fukatani mountains. Both the yolk and the white of an egg are firm and rise, then have rich tastes. This is the first class Koshihikari produced in the mountains of Kanazawa blessed with nature. Both taste and flavor of the rice rank the highest. On eating it you will feel its sweet flavor shortly. The soybean paste we use is well matured sticking to the natural fermentation. Being characterized by rich flavor and mild taste, it must charm everyone.